Today we’re marking the 3rd anniversary of our online launch on May 1st 2011, the date chosen in solidarity with the tradition of May Day. We began with writing a list of twenty or so bands on the back of envelope in 2010 and now, seventy two thousand website visits later, the archive has 150 entries and is still growing. If you can help us to expand and ensure no-one is left out, we welcome new info to help develop the project. It’s not solely about musicians and singers: we’re documenting and celebrating DJs, journalists, event organizers, photographers, sound technicians, poster and magazine producers and everyone else who created the infrastructure for the music-making and cultural-political activism of the 70s, 80s and beyond. 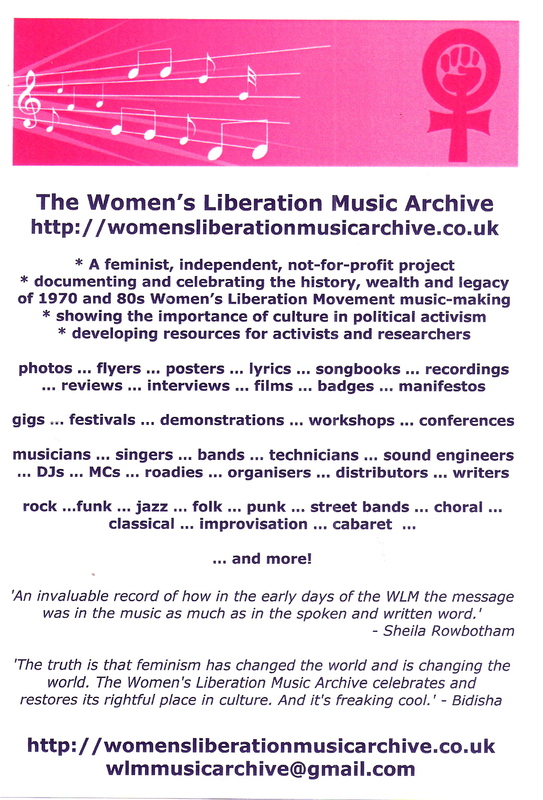 And we like to link with our predecessors to show the continuity of feminist music-making. If you have material you think should be in the archive, or know a woman who does, do contact us!